Stagnant Economy: To boost consumer spending after the 2008 market crash as the “Great Recession” began, our Federal Reserve pushed down interest rates. However, by lowering rates to near zero and digitally creating massive amounts of new money, which lifted our stock and bond markets without healing the underlying economy, they put the investment cart before the economic horse. Today, the situation remains the same and we are now beginning to pay the price. Minuscule interest rates and digital dollars have created mega stock and bond valuations because our economy is stuck in low gear and unable to build up the speed and produce the profits needed to escape this danger zone. Profits are expected to fall another 5% for the most recent quarter, making it the 5th quarter in a row with declining profits. Rates Are Too Low: Three decades ago, the 10-year Treasury bond was yielding 16% and its price was cheap – yet most investors were afraid of them. Recently, the yield hit a new low of 1.3% and government bonds keep going up in price as they are so popular. Investments are the only item people want less of as the price falls and more of as the price rises! Sadly, interest rates in most parts of the developed world are even lower than ours. In fact, outside of the U.S. most government debt sports negative interest rates where you actually pay the government to hold your investment. These super-low rates artificially boost investment prices above their reasonable value, make it very difficult for savers and retirees, and keep banks from being more profitable and lending money which could help economic growth. All of these distort our financial system and stunt economic growth. Federal Finances: Our government’s past spending has exceeded tax revenues for decades, resulting in a large national debt now at $19 trillion. Spread evenly over the 82 million families in the U.S. means your family’s share of the national debt is $230,000. Current spending of $3.9 trillion per year far exceeds current tax revenue of $3.3 trillion per year so the reported debt is growing by $600 billion per year. Even worse, while our government makes our corporations report unfunded liabilities on their financial statements, they don’t apply that same rule to themselves. If they did, the current national debt would balloon to $66 trillion, or $805,000 per family! Future promises greatly exceed potential revenues so the debt will begin to grow even faster. There is much debate about the magnitude of the shortfall, but the present value of that difference is often calculated at over $100 trillion or more, which is $1.2 million per family. Our country does not have an income problem, it has a spending problem! You can visit www.usdebtclock.org for more info. Foreign Fiascoes: First is BREXIT and its potential to spread. If the U.K is the only country to leave the EU, there is less to worry about. However if other countries consider leaving, subsequent votes will spread fear throughout global stock and bond markets. Further, it will cause outright economic panic and havoc if additional countries actually leave the EU. Next is China and its increasingly fragile economy. 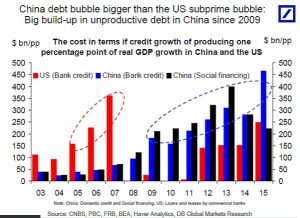 China and its major financial institutions are layering multiple liabilities on the backs of the same assets via their “Wealth Management Products” that ordinary citizens invest in heavily, now pushing 40% of GDP. This process mirrors what occurred in the U.S. where a subprime home loan was used to create other derivative securities all on the back of a single family home. When the music stopped there was more bad debt than home value. China may be a bug looking for a windshield. Sadly, problems don’t go away just because we are tired of hearing about them. Today is not a time for excessive risk taking as risk is not being rewarded. It is a time for caution and diversification away from pricey public market stocks and bonds into safer, tangible assets including gold and real estate that can protect the value of your money. This entry was posted in Economy and tagged bond, brexit, China, debt, deficit, gold, profit, rates, real estate, recession, risk, stock, yield. Bookmark the permalink.